Welcome to Sunday Snippets - I am hoping next week I'll be organised enough to have this up and ready for you to link in with first thing Sunday morning... but last night was spent working out how to use the linky, getting the picture sussed and on my side-bar and basically just getting a feel for things! BUT - I think we are sorted and ready to go... hopefully the linky will work, and we start the New Year off good here :-)! Feel free to join in anyway you like - totally up to you how you set up your post, and what you say... it is just a review of YOUR week, in YOUR words and YOUR pictures! I love my life, and I adore my family - but I am honest; you will find my posts raw and real, and if I have a bad week, you'll read about it! It was not a post about what you're loving; there is another blog with a linkie for this, this is a review of your week (but if it was a GREAT week, wahoo)! So come on over and link up - your week, your way! Last week I finished off with photos of my family Christmas from Dec 30th, so will start this week from December 31st! 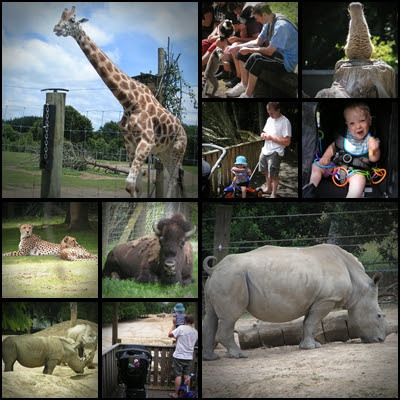 Finally on Wednesday (Jan 2nd) we managed to get to the zoo... how we managed is still something I will never understand! 'lil M had woken at 5am that morning, and by the time we left just after 10am - he'd had maybe a total of 30 minutes sleep! 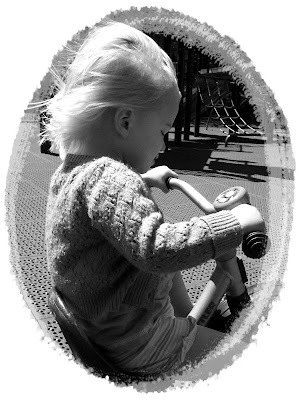 He was just not cooperating that morning, but he is a kid that just takes it all in his stride... we got home just after 1pm, Button had fallen asleep in the car but 'lil M was still WIDE awake! We'd had lunch at the zoo, so I just gave him a quick feed and shoved him into bed - three hours later he finally stirred! The next lot of photos are what I call 'randoms' from the rest of our holiday... they just got bunched together and I'll explain them below! Top & Bottom Left = 'lil M has learnt to crawl! Yep - it's official as of Thursday 3rd January, now he has worked out the 'caterpiller crawl' (bum up, push himself forward) there is no turning back... he is into everything (catfood and washing baskets included), and he will not roll to get anywhere - just to play! So once more there'll be baby-proving going on in our house over the coming weeks! This is the left-overs of my first-ever-made-from-scratch-GLUTEN-FREE-pizza!!!!!!!!!!! So proud of myself... yummy! Top Right = a Te Kuiti High School friend (back in the days) heard we were in Hamilton, and contacted us for a catch up... hadn't seen her since our wedding day 8 years previously! It was lovely to see Gillian, and Button warmed up to her quickly - especially when she discovered the book and puzzle Gillian bought her...! They also spent quite a bit of time popping bubble wrap (you're never too old to pop bubble wrap, huh Gillian)! I also got to catch up with another 'old' friend, Tash! So all-in-all our holiday was awesome... got to see both sets of Grandparents for a day, my brother and sis-in-law and three 'old' friends! As well as go to the zoo, go clothes shopping, pop down to the lake and take numerous walks around the neighbourhood! Sarah = I have some serious house-envy going on, we loved the lay-out of your place; perfect combination for families with young children requiring sleeps, and entertaining! THANK YOU for giving us this opportunity to stay there, and if you're keen (I don't think we left any permanent damage), we'll do it again in a heartbeat! The trip down had been a nightmare, but the trip home was total opposite... both children slept, waking as we were driving down our road; and waking in good spirits (bonus)! This made unpacking that afternoon much easier! It has been a quiet weekend since though, as the kids have been exhausted and both days have given us LONG afternoon sleeps (I'm not complaining)! He still looks a little small, but he is such a busy kid and SO nosy, that this is the easiest way to feed hom now... he also has four teeth, so we're starting him on solid food! Highchair trays are a God-send at these times; but he is so much messier than his sister ever was / is, even with the tray! It also means he can join us at the table, yay for family meals! Last night hubby got our paddling pool out for the kids - we were given it last year from a lovely friend of mine, but the summer was so bad we never got it out! This year I suspect it'll be getting a LOT of use - feeling so blessed, it is such a cool little pool! Thanks for popping in - please leave a comment, I'd love to hear from you... and I will be popping in and commenting on everyone who links up here as well! Have a great week, hubby has two more weeks holiday left so we're going to make sure we make the most of it! So glad your holiday went well - looks as though you had a blast :-). 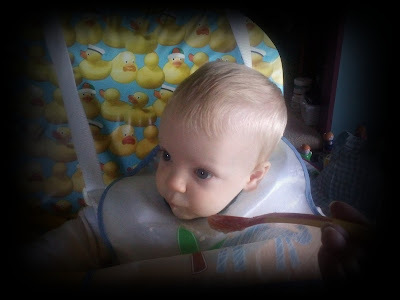 As for Lil'M yet again I say he looks like his great uncle in the high chair photo. 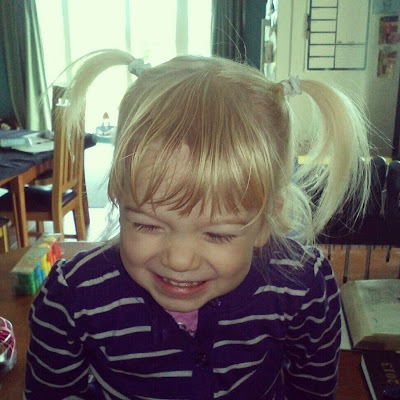 Just love Button's pigtails! And your paddling pool looks incredible! We are going to head out and buy one this week...think we might need it this summer. Congratulations to Lil M for the increased freedom of movement! Yay! Busy start to the year, huh?! Great photos. 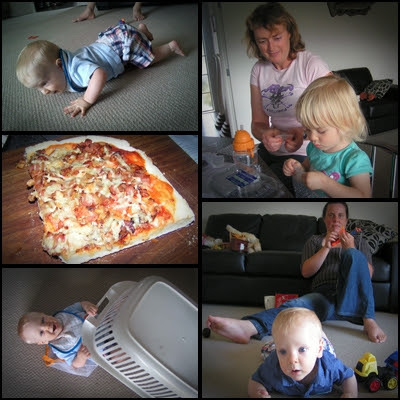 Yey for Lil M's new-found skills, and for your delicious-looking pizza. Happy new year! !